A 56-year-old woman and her five-year-old grandson from Anápolis in the state of Goias, Brazil were involved in a car accident that would have in most cases been fatal. A parked car which was involved in the accident rolled back over young João Pedro Nascimento and his grandmother Vilma do Nascimento, crushing both of them under the wheels of the car. João's neck/head goes under the wheels, but within seconds, he jumps up and quickly goes to help his grandmother. This miraculous event was all caught on CCTV; please note the following footage is graphic. 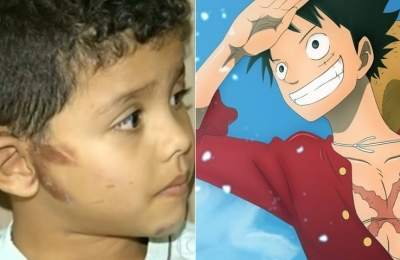 João could be compared with the Japanese anime character "Luffy" which has a special power that makes his body like rubber, in which he was almost completely unaffected by the accident. Fortunately, Vilma do Nascimento also survived with minor injuries. Both Vilma and João were taken to hospital to undergo a series of examinations. João was discharged on the same evening after the accident with minor abrasions to the right side of his face, chin and ear. Vilma was released on Wednesday morning suffering from cuts and bruises to her legs and head. Later when interviewed by reporters, João said he was more concerned about his grandmother than himself.